While the symbolism faithfully follows the Rider-Waite deck that inspired her artwork, Mary Hanson-Roberts’ detailed drawings stand on their own in conveying the meaning of the Major and Minor Arcana cards. The delightful images spark the imagination for insightful tarot readings. The smaller cards are easy to shuffle, even for youngsters and beginners, who will be drawn to this magical deck. Seasoned tarot readers will return again and again to this dreamy deck. Card titles in English, French, German, Italian, and Spanish. 78-card deck comes with instruction booklet. Voted as one of the all-time best Tarot decks by Aeclectic Tarot readers. Also by Mary Hanson-Roberts: Whimsical Tarot and Universal Waite® Tarot Deck. See also: Hanson-Roberts Tarot Companion Book. Cards measure 2.375" x 4"
Don't assume that the friendly, approachable Hanson-Roberts cards are lacking in depth. Look closer. The images of the Three of Swords, Four of Pentacles, Five of Wands, Nine of Swords, Hierophant and Devil all convey the darkness and/or complexity of those cards in a way that should spark any reader's imagination and intuition. And when I turned over The Sun as a friend's "final outcome" card recently, I felt like it lit up the whole room. That's what The Sun card should do … Be prepared to let the Hanson-Roberts surprise you, because it might. I recommend this deck to beginners and experts alike, whether you're getting your first or adding to a collection. The "standard" Rider-Waite interpretations combined with clean, visually pleasing art make it easy to learn to read these cards. Experts will be thrilled to have a deck on hand that they can read at a glance without any confusing new symbols. If you want a "standard" deck but you aren't thrilled with old style Rider-Waite decks, this is definitely for you. This deck absolutely deserves the kudos other reviewers have given it. Being an unshamedly faithful Rider-Waite clone, any complaint about its lack of originality is moot. Anyway, once you behold its plethora of delicately colored pictures, you will not bemoan the cash you paid for this little beauty. 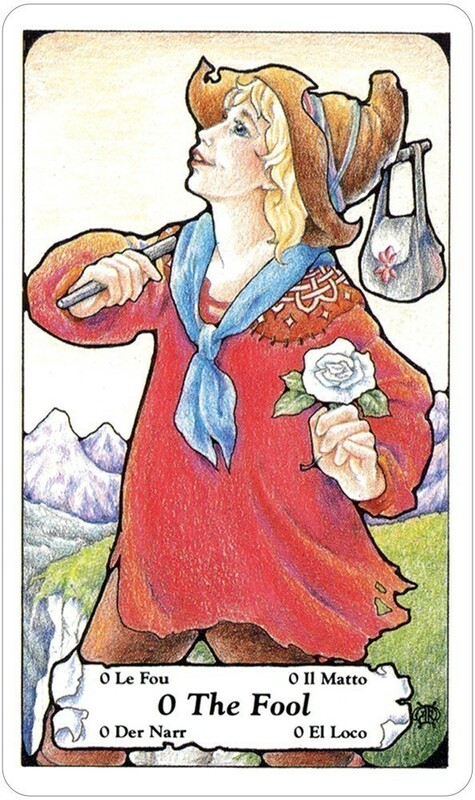 Hanson-Robert's artwork may be sweet and simple, but it is surprisingly resilient too, in that her tarot images stand up well to repeated use -- so complementary and responsive to your intuition they are. Hanson-Roberts certainly never minimized any of the darker imageries from the Waite-prototype. It is a very competent Waite-clone; whose art-style just happens to mimic that found in children's fairy-tale books. This deck is a pleasure to use or look at, even if you aren't a die-hard follower of Waite-ian tarot symbology. One for the collection. 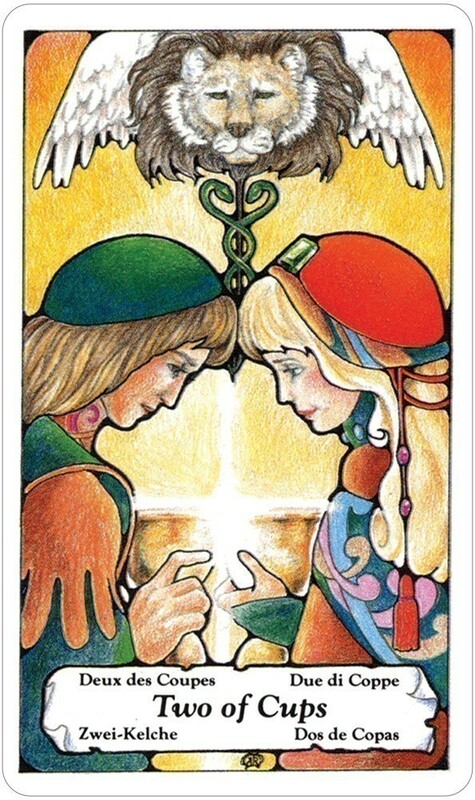 The HANSON-ROBERTS tarot deck is by far my favorite of all the traditional tarot decks, because it has a "lightness of being," fairy-like or angelic quality to it, while at the same time maintaining the integrity of the original Tarot symbols. People (especially children and psychic/sensitives) will likely find themselves instantly attracted to this deck because of the feeling of purity its illustrations are imbued with. 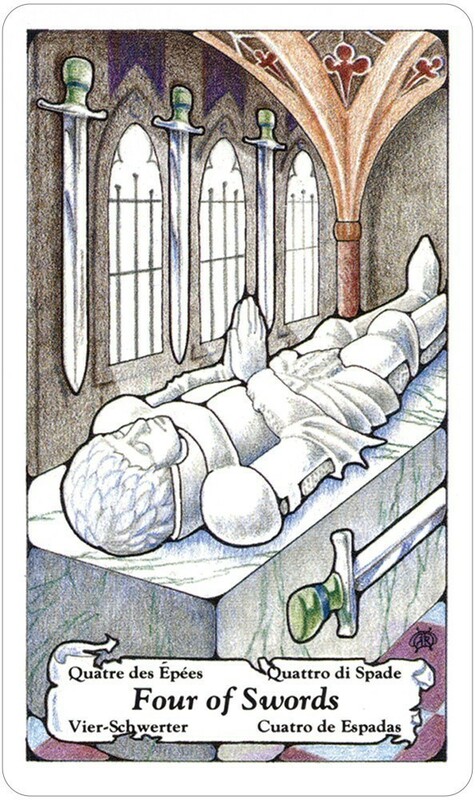 Colorful and cartoonlike, each card's illustration still manages to convey even the most somber of moods, such as the lifeless solemnity of the knight's effigy resting atop a marble tomb on the Four of Swords. 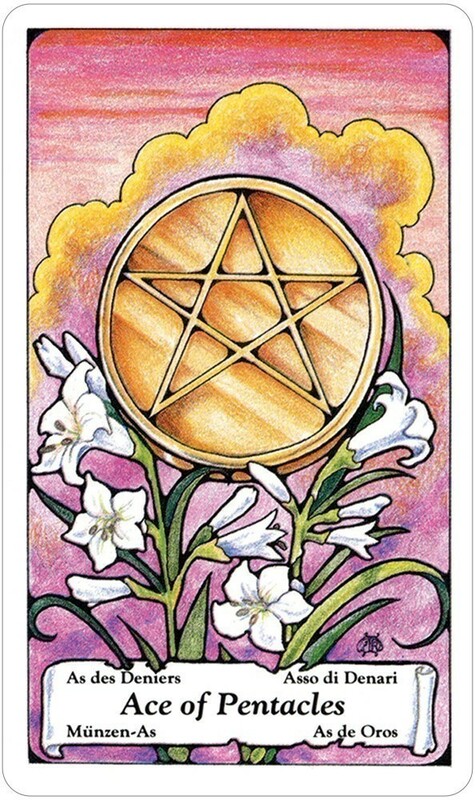 Other cards, such as Temperence and The Star shine with such radiance that one feels uplifted just to gaze upon their beauty. This is a Tarot deck to cherish forever as both a work of art and a divination tool to share with others -- especially those with sensitive natures. What intrigued me the most about this deck was dual functionality of its depictions. At first, the illustrations may seem soft as if seen through rose-colored glasses or a diffusion lens, but upon greater scrutiny, the discerning viewer will note that each of the images draws with the strength of a magnet, enabling the reader to grasp the card's intent both alone and more importantly within the context of a spread as if it were an old friend whispering secrets. 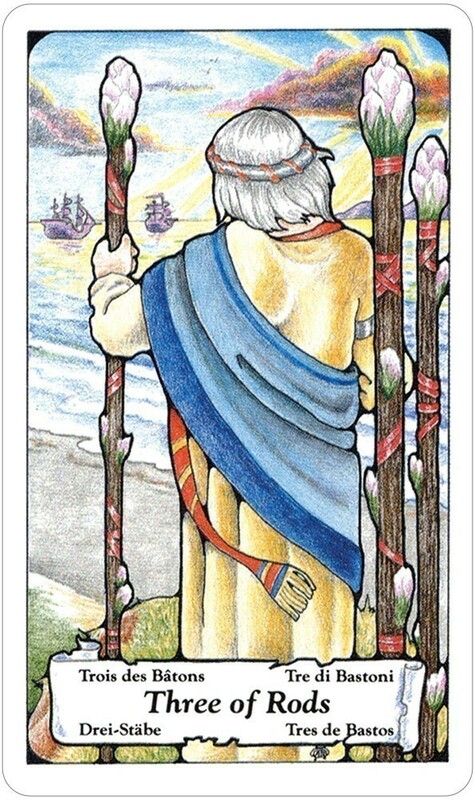 The minor arcana color palette -- rusts, reds, pinks, oranges and browns for Rods and Pentacles, grey, silver, white and blue for Swords, and yellow, gold, green and blue for Cups -- again allows the reader to achieve instantaneous recognition, while the major arcana positively sings with symbolism. The Strength card represents one of my favorites -- an individual who controls through caressing and compassion rather than brute force. Even the more "sinister" cards like "the Tower", the Devil, the three of Swords, and the nine of Swords convey powerful yet palpable images that aid the reader to gain multi-dimensional insight into the overall message being relayed. If you, like myself like the Ryder-Waite-Smith depictions, and are interested in something with a whimsical gypsy charm, the Hanson-Roberts deck may appeal to you as much as it appeals to me. Recommended for those who like an artistically designed playing card sized deck with Ryder Waite Smith symbolism. Just months ago I took the plunge and bought this luminous deck. And opening it up and slowly going through the cards was such an amazing discovery. Why this deck isn't all sugar-coated and "cute". Each card is artistically redone in a passionate and evocative manner. And stays true to the meaning and RWS. This is a deck that is deceptive. It may be talked about as if it shallow and full of cherub children, which is isn't, but in reality it is a deck with a lot of power to be heard in a loud and clear voice. It reads like a dream. The pictures are incredibly intuitive. The art is breathtaking, the shading is just gorgeous. You can spend many hours looking at all the little details. If you're looking for a more visually stunning and intuitive Tarot deck that is completely RWS based … look no further than this faerie enchanted mystical creation, you won't be. 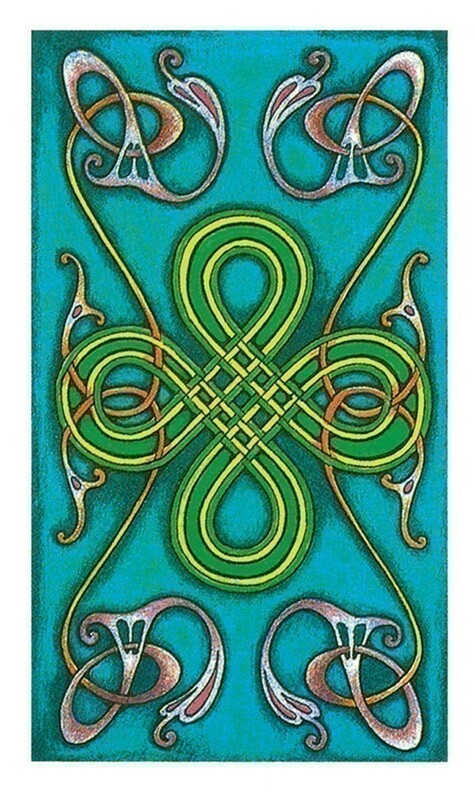 The Hanson-Roberts Tarot deck is a lovely deck, which draws on the traditional imagery of the Rider-Waite deck, yet still has its own unique look and feel. The images are done in pastels, and are drawn beautifully with attention to detail from the expressions on the faces of the people in the cards, to the small details in the backgrounds, which only assist in conveying the meaning and message of each card. If you read cards in an image-based method, rather than straight from a book or memory, this is an excellent deck. 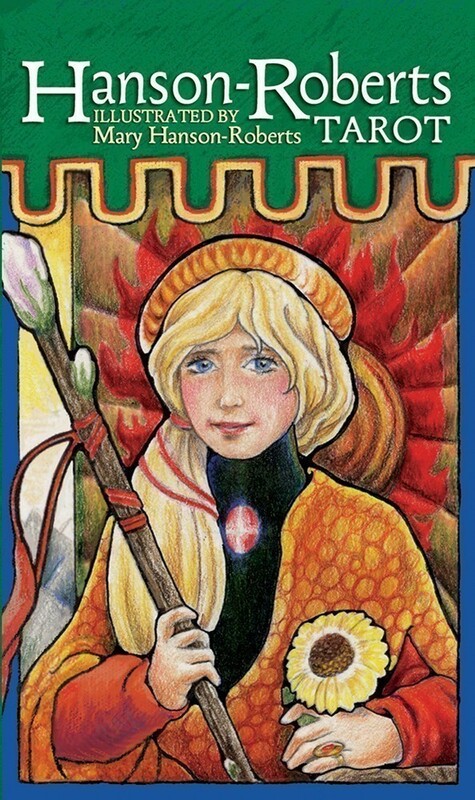 The Hanson-Roberts was the very first Tarot deck I ever purchased and I learned to read with it. Now after years of collecting and using dozens of different decks, the Hanson-Roberts is the one Tarot deck I keep returning to. 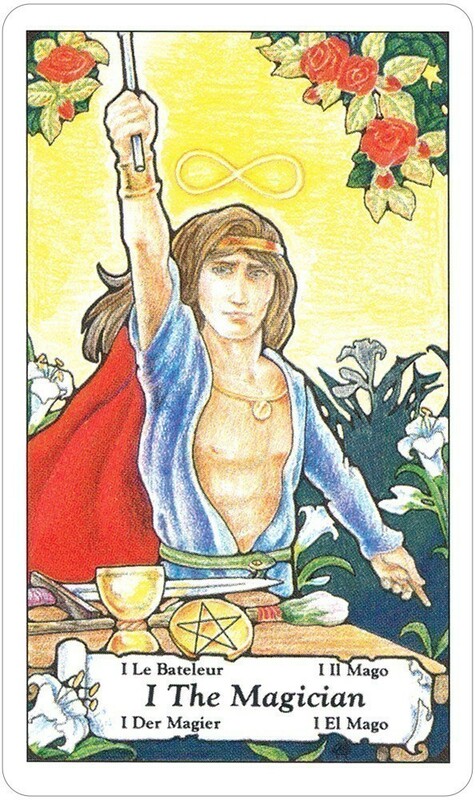 It is also the deck I use the most for my personal readings. The artwork is friendly but deep in symbolism. The coloring is wonderfully rendered and pleasing to the eyes. The images facilitate accurate, detailed readings, inspiring intuitive flashes of insight. Even so many years after its initial publication, the Hanson-Roberts remains fresh and very appealing. This deck is excellent both for beginners and for anyone looking for a beautiful addition to their collection.